What is Indoor Field Hockey? Twice a year we offer Free Beginner Clinics for boys and girls in Grades 2 – 8 who would like to try out Field Hockey. We provide field hockey sticks for use at the clinics, so kids just need to wear athletic clothing. Our clinics take place right before or near the start of our Spring and our Fall Seasons and are typically an hour in duration. We are holding a FREE beginner clinic in Dallas on Saturday Feb 23. The Clinic is for players in grades 2 – 8 who have never tried Field Hockey before. Equipment : Hockey Sticks provided. Wear athletic clothing & bring a water bottle. All players MUST REGISTER in advance to participate. Lone Star Field Hockey was founded in July 2015 to promote and develop youth Field Hockey in Austin, Texas. 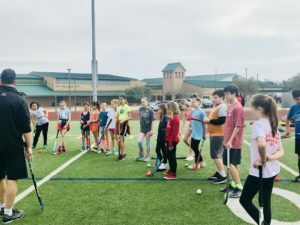 In October 2015, Austin’s Adult Field Hockey team merged with Lone Star Field Hockey uniting efforts under one club to grow the game of Field Hockey in Austin and Central Texas. In April 2018 we announced the opening of a branch of Lone Star FHC in Dallas, TX. Lone Star FH Club is a 501(c)(3) Not For Profit Organization. Stanford 6’s – Everyone a winner!